Bots. They generate over half of the internet traffic and over half of the bots are malicious (or of questionable value). Bots can make your systems vulnerable to scraping bots, account takeover bots, impersonators, spammers and hackers. 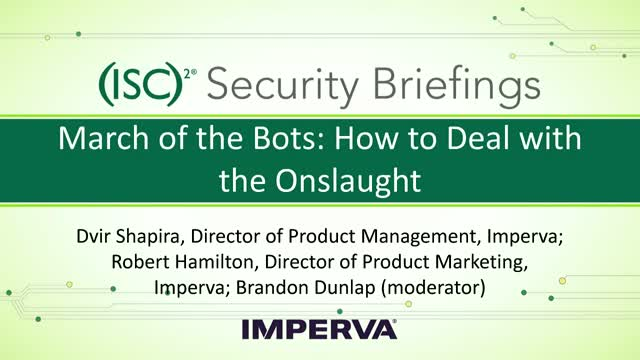 On February 8, 2018 at 1:00PM Eastern, Impreva will share data gathered from their security research team about the most recent bot trends, how bot traffic is changing, where it’s coming from, and the top actions you should be taking to mitigate the effects of bad bots on your websites. Join us for Part 1 of a 3 Part Security Briefings series and understand how commercial services take a multi-layer approach to bot mitigation and management and whether one of these services may be appropriate for you.